Now, you are really having fun with your sewing hobby, because you have best embroidery machine for home use. But, do you know that the machine that you have and use doesn’t appear suddenly? This very useful machine actually has long history. And, if you compare the today’s machine with its earlier version, you will find there is huge different between them. The funny thing is the changes of embroidery machine are almost similar to computer. It started from ridiculously big size to the small and easy to carry machine like what you can find today. Most of people thought that sewing machine came first, and then embroidery machine came as the modification of that machine. Actually, it is the opposite. Before Isaac Singer patented the sewing machine he’s created in 1846, Josue Heilmann has already made embroidery machine. And, this Frenchman created embroidery machine 20 years before Singer. Heilmann invented machine that can hold fabric and move the needle to create embroidery. At first, he was afraid, because his machine threats the hand embroidery industry at that time. Therefore, he only made 2 machines. But, because of technology revolutionary, his machine became one important tool that was existed in that era. The computerized embroider machine was created by Isaac Groebli. However, don’t imagine that the machine that he was created that time has built-in computer like what you can find today. Groebli only created the automatic system in his machine, which is called Schiffli machine. Even though this is the simple automaton system, however the result is much better than the hand embroidery industry at that time. Schiffli machine can create really smooth result, but with much better efficiency compared to the hand embroidery. This result created big change in this industry, where home business and factories started to appear in great numbers. Then, the modern embroidery machine came into the world in 1911. The one that create it was Singer Sewing Company, the similar company that was built by Isaac Singer, the inventor of sewing machine. This modern machine has size head and pantograph that can trace the design and sew embroidery on fabric. The production of this modern embroidery machine was stopped, when war broke. However, in the 1950s, after the war ended, the production of the embroidery machine was reborn. It make the home industry in this field was also exploded. The closest to the today’s embroidery machine was created by Wilcom in the 1980s. That machine has similar ability like what you can find on today’s machine. It has better automatic system and makes everyone have no problem in using the machine and create embroidery pattern on fabric. The machine that you can find today is the fruit from those long journeys. And, that journey hasn’t ended yet. With the rapid technology growth that you can see today, we can expect that there will be much better and perfect machine in the future, that might be able to blow your mind away and create best result you never imagined. Best electric shaver is the secret of painless wet or dry shaving. By using such kind of shaver, you can also reduce the risks of wounds during shaving. As the result, you see a perfect and clean skin and it increase your confidence before doing daily activity. So, what kind of electric shaver do you need? Check the list below. Some of you might be too lazy to shave your hair because of your sensitive skin problem. Now, you don’t need to worry anymore because Wahl Professional 8061 helps you. As the best electric shaver, this product is designed for sensitive skin. Let say, to support the performance Wahl Professional 8061 is using Dynaflex cutting technology. This technology is applied to make the shaver able to reach the most difficult areas such as around neck and jawline. The most important, the process can be done faster and efficient. The performance is also supported by hypoallergenic foil so you can do the shaving smoothly and close shave perfectly without any problem. The foil is also designed to protect your skin and the material from bacteria which triggers skin irritation for sensitive skin users. In the form of design, Wahl Professional 8061 is handy and lightweight enough. The material is high quality plastic and it makes this product a great option if you don’t want to buy an aluminum or metal electric shaving machine without loosing the premium sensation. One thing you need to consider is that this product is more suitable for stubble hairs or people who love to shave daily. How about if you like to use something high tech even for your shaving machine? If it is so, you have to include Philip Norelco SensoTouch on your best electric shaver. Because of its performance and feature, this product is also known as the king of rotary shavers. You can use Philip Norelco to clean beard or hair effectively and faster without suffering from any skin problems including skin irritation. Thanks to the rotary system which makes the shaver stick to your skin and it makes the shaver works smoothly for the cleanest result. The three round foils are also installed in order to make the product follow the contour of your face easily. So, what is the meaning of 3D? This is the interesting part of Philip Norelco SensoTouch 3D. Just imagine you can control this electric shaver into 3-dimensional pattern which might be the first shaver which takes that kind of system. One more technology used is Super Lift & Cut which used to make sure that you can cut hairs on the most difficult areas perfectly. Some people don’t really love with the plastic and rubber material but it might be your option if you want to find a lightweight electric shaver. It is your luck if you are using high performance as well as affordable electric shaver. Remington F5-5800 might be the answer for those who want to use such kind of electric shaver. The first eye catching element is on its cordless recharging system. Moreover, they are also offering a head with one trimmer and two foils. This type of head makes the shaver comfortable to use and flexible even for those who have sensitive skin just like you. Definitely, you don’t have to suffer from skin irritation after shaving. Welcome the clean and perfect skin and say goodbye to torturing shaving. Remington is also a solution for those who want to use a lightweight electric shaving due to the use of high quality plastic. The problem is that the design is unsuitable for close shave and you have to replace the blade every three or four months otherwise it triggers skin irritation. Some of you love to do noise shaving? If it is so, try this product. The noisy sound might be a problem but you will get great shaving result for your sensitive skin. That’s why Remington F5-5800 is also included on the best electric shaver for sensitive skin. The point is that you don’t need to desperate with your sensitive skin if you want to shave it. 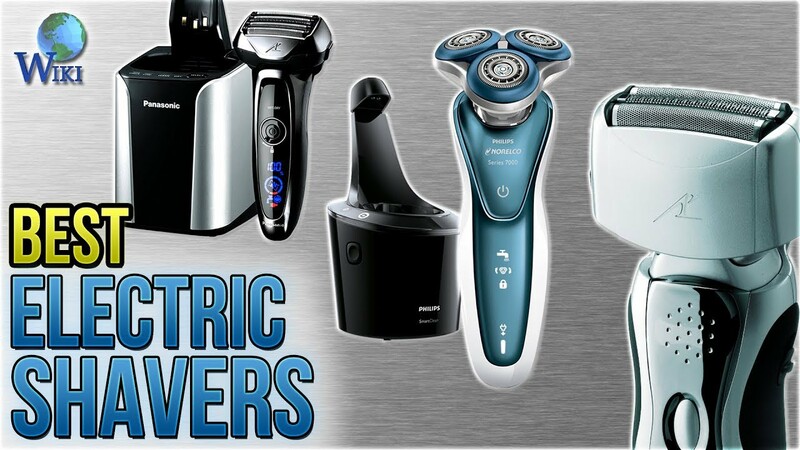 The top 3 electric shavers for sensitive skin above are the answer. Later, you can shave your beard or hair without anything to worry about anymore. As a person with sensitive skin, you have right to have a clean and fresh skin and it can be achieved by using the best electric shaver only. There. Truth is advised, we are relieved because a job was not to start than having to shave. But let us be clear, growing your beard does not mean that you’re in a position to really go all caveman. You’ll keep it neat and trim. Just a tiny zap with the perfect beard trimmer allows you seem just like you attempted without actually having to try out a lot of. It is a.There are many electrical shavers on the market it can be overwhelming. And a few have as many options. Personally, we are searching for a durable trimmer having a fantastic battery life (since we constantly forget to control it), a few whistles and bells so we can get creative if we are going with a goatee or thicker mustache appearance, and some good power at an excellent cost. We have compiled best electric shaver and our trimmers reviewed: By placing them each to determine ease of use, comfort, and functionality we assessed 10 razors. We analyzed after a few days growth and in certain cases a razor’s operation for both upkeep. As we could learn how well they functioned as a trimmer. Razors have. We tested specialty functions, like cleansing channel and the charging dock, to see whether they completed the way. Our recommendations are based on these evaluations, in addition to on the report of his expertise of every tester.Our board of man testers took these electrical razors house and used them within the span of 3 times or longer. Attention was paid by our testers to aggravation, smoothness, difficulty areas and the number of moves it required to have a close shave. A questionnaire that emphasized their expertise working with the razor was filled out by every tester, and their own expertise was considered by us. Our process consisted of a substantial number of research. Our positions took into account product advice for every razor. We contacted manufacturers to make sure we got our facts right. All testing information and our research were implemented to reviews and our recommendations that will assist when picking the razor you make. It was a remarkable actress that is top. It provided a very close shave, akin to what you would encounter with a shaver. It accomplishes a close shave using technologies that adjust to your own face. The head rolls and pivots and the foil blades proceed, thus molding to the contours of the face. An hour of charging time provides enough juice. It will remain charged for weekly, daily if you are shaving. The attribute provides electricity for one shave. This razor weighs two lbs, which gives a good feel to it. However, you might feel on your wrist for the ramifications of its heft. You can wash out the mind by running it when you are done the shaving. And that means that you may allow it to do the cleanup job as it costs, however, the charging base functions as a cleaning station. The Panasonic Arc4 ES-LA93-K is a lightweight razor which employs a four-blade transparency cutting platform to offer an incredibly close shave. In our evaluations, we had to shave a couple of times maximum to find there is much like a shave shaving it a shave fast. It’s a two-motor system, making the blades operate up and down to offer a shave that’s nearer than many electric razors can handle. Our expert found that his pull did not irritate or tug in his hair. Our expert reported results, although the chin and jawline are inclined to be problem areas with razors. There’s only one setting which means you can not trim using this razor. It includes another precision trimmer. It may be immersed in warm water and also used at the shower or with shaving lotion while we analyzed this razor tender. While the battery has been charged furthermore, the razor lubricate and will clean. There is not a gap between razors within this region, although the battery life is the shortest of any we examined. In case mid-shave runs out, it is possible to plug it into complete shaving. In 0.44 oz, it’s feather-light and comfy to hold. Some folks can find it a bit too mild. His one is high-functioning and constructed, although extremely electronics can feel economical. It supplies cleaning reminders and features an alternative a precision attachment and an LCD display that tells you when the battery is getting low. The Wahl LifeProof razor is cheaper without sacrificing quality, although most cost over $ 100. It does not have a lot of extras, but we had been impressed with its functionality, and it made a 92 out of 100 for functionality and simplicity of usage in our evaluations. After using it for four times, 1 tester remarked that this razor stitched better than razors he is employed previously. He did not hurt his encounter and explained it had been smooth. A standout feature of this razor is its battery life, which doubles the majority of the razors within our comparison. Though some razors provide as many as five, it has one shaving set. If you wish to be clean, this is not an issue, but this razor will not take action if you would like to trim a beard or abandon stubble after you shave. It lacks extras such as even a precision trimmer or an attribute, also it does not have attachments such as even a cleaning station or a charging dock. This razor is typical in weight in 1.5 lbs. It takes than other people, but will remain charged each and every single day if you use it. Now’s creative facial hair motion has finally trickled down into gadgetry, with the growth of an array of products designed to perfect that scruffy, stubbly face you have worked so difficult to get right.It’s a product class which, surprisingly for once, we really require. Electric razors do not do the job. Clippers are unwieldy to use on the face. At a minimum they function as a highly adjustable clipper (usually allowing you to define the height of the hair you want to trim down to a fraction of a millimeter) and as a combless razor, so that you can clean up wayward strands and total intricate shaving jobs, all at exactly the identical device.I’ve been using an assortment of styles for many weeks, and I use one almost daily as part of my dressing routine. I use a styler to shave hair in weird places in which my razor is not effective (near my ears, a Bermuda triangle beneath my chin), and to even out my sideburns. Using a comb attached, I will cut the bush that develops behind my ears, where the hair inexplicably grows too fast — and it is a godsend for doing detail work in my own, the way to put this delicately, my love like Baal.I analyzed four unique styles to determine which was most versatile and effective. Here is the gist. The Philips Norelco OneBlade Guru (Rating: 8, $80) is described by the company as “revolutionary” and while I may not go that far, it’s among the more versatile and unique hybrids on the market. The major selling point is the dual-edge layout: The head of this one blade includes a cutting surface on the top and the base of the blade so that you can trim in 2 directions, however, you’re holding the device. When using it possibilities open up. Holding it perpendicular to the skin enables you to up sideburns readily, while holding the blade against the skin enables it to shave off stray hairs wherever they may be. The blade is very thin, so it is simple to get up close and personal, although it’s totally comfortable in use. Phillips Pro version involves a single adjustable comb which lets you dial on your trimming thickness manually. The dial idea is intriguing, but in practice, it is rather bulky and will get in the way. Also included in the box is a somewhat flimsy charging station (it is not wireless, only a conduit that connects the one blade into the cord). If you’re able to do with no detachable comb as well as the charging station, the normal one blade, at only $35, is a really persuasive alternative.The Gilette Styler (Rating: 5; $24) bills itself as a trimmer, edger, and shaver all in one, and it is a significantly different choice from the other products in this lineup. For starters, it is tiny, about the size of a Sharpie, and it is sold in a blister pack rather than a box. Designed as a low-cost option, the rechargeable battery was jettisoned in favor of one AA battery (mine came preinstalled, but dead on arrival). The Gilette Styler does feature an array of alternatives. The normal head is a trimmer much as you find on the back of an electric razor. Three combs are included if you would like to use this for cleaning up beards and more hair. As it is a Gilette merchandise, obviously it can convert into a shaver, also: A special attachment clips on top of the trimmer, which subsequently accepts a typical five-blade Gilette cartridge (anything at the Fusion brand).Ultimately, the small size hampers the Styler from being successful. For those who have a full beard, then it is going to be just too diminutive to produce rapid enough work of cleaning it up. The attachment mechanism is somewhat temperamental, too. Having said that, as it is so compact and does not need another charger, there is at least a case to be made for pitching it into your overnight bag for emergency needs.The Braun MGK3080 (Rating: 6; $60) is a considerably different offering than the Gilette, but it suffers from some of the exact issues. Finally, a manual Gillette razor is included in the box, only for kicks.BraunThat’s a lot of things to mess your cabinets with, and when it worked all that well I would not mind. Though successful, the body groomer is quite loudly, the combs are not stable enough on the trimmer, and the precision trimmer, such as the Gillette’s, is too small to succeed unless you are shaving routines into your stubble. (Are we doing this?) My main gripe is with the overall layout, however, which feels flimsy and oversize, and which puts the power button on the back of the shaver rather than in easy reach on the front.The Conair I-Stubble (Rating: 7, $50) may be saddled with a terrible title, but it is more effective than I had initially estimated it would be. The design resembles a normal clipper, with blades set at a 90-degree angle to the handle. A plastic comb folds over on top of the blades for trimming jobs, and the thickness of this comb is adjustable (using a motorized mechanism) to different levels between 0.4mm and 5mm in length. A digital readout on the handle indicates that the comb thickness, and if you would like to shave straight against the skin, you flip up the pulp and round the back of the unit to receive it (sort of) from the way.Unfortunately, those additional electronics trigger the I-Stubble to be somewhat bulky and heavy, and the thick blades are rough against the skin. Nevertheless, the device is effective when combined with the comb or as a razor, even though it’s less comfortable than other possibilities, and all that excess hardware gets in the way when you are doing exceptionally delicate work. Hair tends to get stuck in the intricate web of plastic combs, making it tougher to clean (although it may be rinsed in water). Life does not come with an instruction manual and descriptions of electrical shavers do not come with translations. They are all features on the electrical shavers below and we will be damned if we can work out which to buy only from the descriptions. That is why we’ve tested models from three of the big brands to give you a feeling of what you wish to pay for. The most affordable of the three was140, and for anything and that more expensive you can expect a wet and dry shaver that may be used with or without shaving foam and taken in the shower, added trimmers, a travel pouch and a fast charge feature that offers enough juice for one shave on a couple of minutes’ charge time. What are you becoming? There are three blades: a trimmer and a foil blade both sides of it, among which is retractable to allow the trimmer perform its work unencumbered around the neckline. There is also a trimmer on the back for carrying up sideburns and taming. From the Series 3 range, you can find a charging station that also cleans and lubricates, or strips off all of the features and just receive the identical head in a wet/dry body with decreased shaving time per charge for approximately #40. What is it like? It has got the best sense of those on evaluation, fitting in the palm satisfyingly and being weighty without being bulky like the luxury Panasonic below. It took us a few tries to accomplish a thorough shave around — including one disastrous attempt to shave in the shower with a clouded-over mirror — but after a little practice (and learning to retract one of those foil blades) we could smarten up four-day expansion to an acceptable degree for work. It has also got the most gratifying sound of the crowd (this thing, trust us — the Philips SW7700 is extremely annoying) but it will vibrate over the others on this listing. It is billed on a rack, which is thankfully not as shaky as its small base indicates it could be, and there is a long cord so this might be installed permanently on a dresser or bedside table. We have avoided the stereotype of German technology up to this stage, but the cap fits. What are you becoming? The mind can bend in five directions and there are some other indecipherable qualities that will mean as little to you as they do to us. It is going to run for one hour on an hour’s charge. This special edition Star Wars-branded Light Side shaver is not Philips’s top-of-the-line version. Obviously the Dark Side SW-model (roughly #320) is enchanting, but there is a greater price (as with the true Dark Side — although unlike real life it is not stronger), and there is the Shaver Series 9000 that boasts another shaving system of blades and comes with a cleaner (roughly #350) or without (around #300). Drop down to, say, the Philips 3000 (roughly #110) or 1000 (roughly #45) and you are losing runtime and the precision trimmer, obtaining a different blade system, relegating yourself from five- to four-direction heads and, in the event of the least expensive alternative, losing the wet/dry choice, charging power and time. What is it like? Let’s get the biggest flaw from the way first. It is a Jedi shaver and it does not create the lightsaber power-up noise when you turn it on. The high-pitched complain it does emit is huge, hugely disappointing. It does have a string of largely indecipherable icons on the deal, but one’s the Millennium Falcon that saves the day (just like in real life). This pup flew over our skin with minimal aggravation even when dry shaving unexpected, considering rotary shavers are regarded as harsher on the skin. What are you becoming? For this type of money, you would want a good deal and Panasonic delivers. Panasonic also makes a lot of the ability of the motor. At this price, you also get what is essentially a sterilizing bathroom for the razor which cleans and charges. The only other Panasonic electric shaver we all think it’s worth telling you about is your ES-LV65, which as far as we can tell is the identical electric razor with no cleaning station. And it is around #149.99. What is it like? The head is bloody huge and it’s got a liquid blue crystal screen to allow you to know how long you have been shaving along with the percentage of battery. The tone that the shaver makes is greater than the Braun, lower than the Philips and more competitive than both. It is the business. The cleaning station is a superb idea for keeping the shaver at a more sterile state than many people have time for, but it is pretty chunky — too chunky for the crowded bathroom and bedside tables in our home. If you do not mind the oversized head, we would say the #150 ES-LV65 is the pick of the bunch.